What is faith? Hebrews 11:1 [Article] tells us very clearly that faith is being sure of what we hope for and certain of what we do not see. Hebrews 11 has been generally known as the Hall of Faith in the Bible, and in Hebrews 11:6 we’re told very clearly how important faith is – to the extent that without it, we have absolutely no way of pleasing God. Faith is one of the few most fundamental concepts of Christianity, along with love and hope [1 Cor 13:13]. In today’s study we will examine the two most fundamental beliefs that spearhead the Christian faith – the belief that God exists, and the belief that God lives. 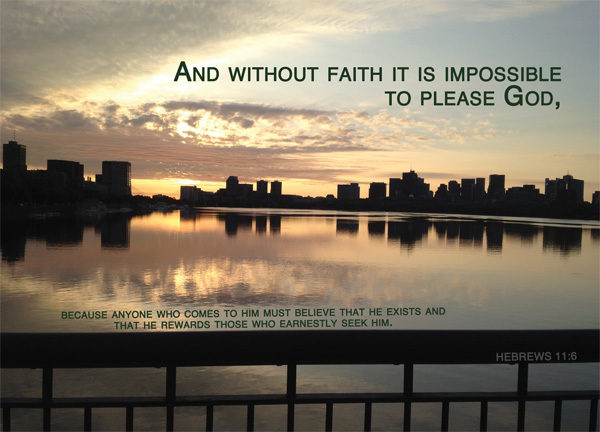 And without faith it is impossible to please God – I think there are many things that God delights in. Perhaps when we extol him in praise and worship. When we turn to him in prayer in times of difficulties. When we give all the credit to him in our accomplishments. When we love one another. When we follow his word. When we do good work. Yet, perhaps many of these things can be done superficially and without true faith. It’s an age old question whether non-Christians who are morally upright, do plenty of good, very charitable and pretty much does no fault in their lives – would they get saved? Without faith, God does not take delight in their good work. It’s as simple as that. because anyone who comes to him must believe he exists – in Genesis 1:1 [Article] it says, in the beginning God created the heavens and the earth. Regardless of which version or language you prefer, God is mentioned in the first few words of the Bible. The first verse of the entire Bible is the first check of Christianity – if you do not believe that God exists, you disagree with that first verse of the Bible, and there is no point reading on; because that is the first thing, and perhaps the greatest thing that forms the basis of this faith. Perhaps especially so for the offsprings of Christians, born in Christian families, whether a second-generation, third-generation or subsequent-generation Christians. Do you believe that God exists? Surely you know it, but do you believe it? Your parents told you so, your leaders told you so, your teachers told you so. But do you believe it? This is the first check of Christianity, but it’s not the only check. Yet it is the greatest check. Everything else in this doctrine counts for nothing if you do not believe that He exists. and that he rewards those who earnestly seek him – do you believe that when you seek the Lord, you will find him? Do you believe that when you pray, he listens? Do you believe that when you desire for him, hunger for the daily bread and thirst for the living water, the holy spirit will be poured unto our hearts? This is equally important to the belief that God exists, though certainly not the foremost check – after all, it would be meaningless to ask if you believe that you will find God when you seek him if you do not believe that God exists. This is really not to suggest that we ought to be motivated by the reward, and hence seek the Lord. No, we do not seek the Lord because of the reward per say, though we must believe that we will be received when we seek the Lord. A god that exists and yet does not receive those who seek him is not a living god – our Lord is a living god. God sought us out first – hence there is no way that we cannot find him if we truly seek him. Sometimes we may not feel him. In times like that we just got to cling on to our understanding of this unchanging God, who has promised, eternally, to bless us and keep us. The Christian faith is defined by Hebrews 11:1 – faith is being sure of what we hope for and certain of what we do not see and the Christian hope is not an if – it’s a certainty. Christian faith is a simple enough concept to grasp, but it is not easy to live out. In Hebrews 11, the Hall of Faith, there were many faithful people or groups of people identified and commended. But at the end of it we are told – These were all commended for their faith, yet none of them received what had been promised [Heb 11:39|Article]. Most of them did not see the deliverance of their nation in their lifetimes. Christian faith is not easy. It will sometimes waver. It will sometimes stumble. But at the end of the day, cling on to these two beliefs – the belief that God exists, and the belief that God lives.